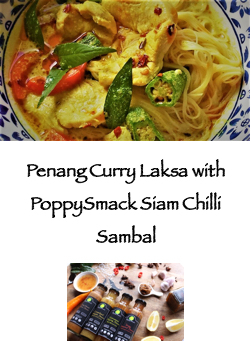 Warm up 1 tbsp of PoppySmack Siam Chilli Sambal in a pot on Med heat. Add more to your liking. Do not allow Chilli Sambal to burn, then add half a tsp of Tumeric or Curry Powder. Spoon Curry Laksa over the noodle and garnish with Mints or Basil to serve. NB : Chicken can be replaced with Prawn/Seafood or Tofu.